The Pool Protector Swimming Pool Alarm is one of the best items to protect children and pets from drowning in your swimming pool. Every year, more than 900 children, between 1 and 14 years old, die for drowning. This type of accidents are avoidable if you adopt a good alarm system that notify you if a child or animal has fallen in the water. It's important to have the tranquillity knowing that a silent watchman always on alert to notify you if anyone or thing needs help in the pool. The Swimming Pool Alarm is so easy to use. Put in 2 AA batteries (supplied with the device), and place the object on the edge of the pool. Put the pin in the concrete, by drilling a small hole, so the pool alarm won't move. Plug in the base in the place where you want to be notified, set it and forget it! It's also easy to turn it off when the kids are aurotized to play in the pool, with your supervision. The Pool Protector Swimming Pool Alarm is an electronic monitoring system that sounds a loud alarm when your children or pets fall into an unsupervised pool. It's portable and light weight. The entry into the pool will be detected by the electronic sensor, triggering a loud pulsating alarm at the remote receiver. Also the Pool Protector Alarm installation is very easy and, after you install the alarm, it can't be de-activated; so it's always in the alarm ready mode until you put it in “Sleep Mode”. If someone tries to remove the protector, it will sound an alarm. The Swimming Pool Alarm includes with a remote receiver which can be mounted up to 200 feet from the main unit. It comes with a 12 volt power supply. The alarm uses one a 9-volt battery (not included) which should last approximately one year. In the system there is also an audible low battery indicator which will sound at the poolside alarm and the remote receiver. This really is a great, simple, and fool proof way to protect your children or grandchildren. 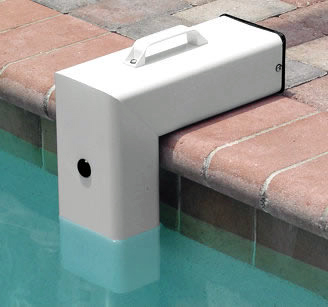 The Pool Protector Swimming Pool Alarm is really a simple and reliable way to protect children and animals.